Painters in the Third Dimension. Carolyn Gilbert, Kenneth Merrick, Emma Smith, Catherine Fookes. 18 July – 11 August. Nathan Homestead. 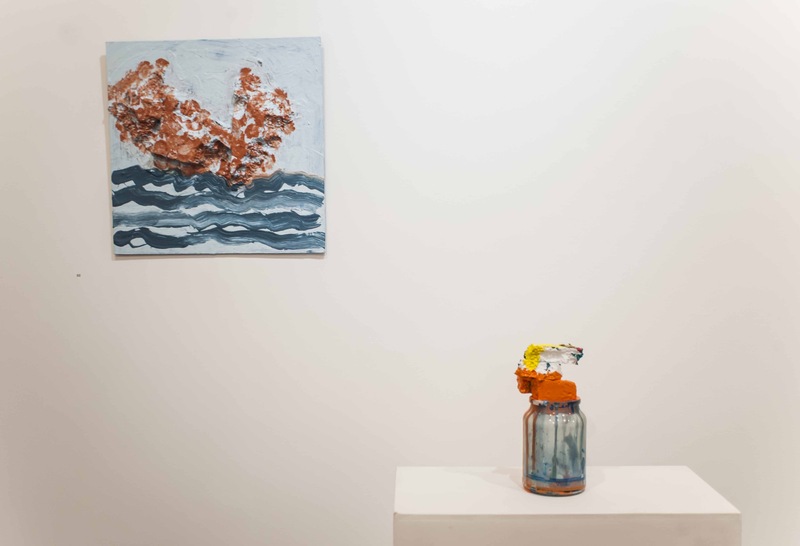 The group show recently on at the Nathan Homestead (18 July to 11 August) presented a diverse and coherent body of work. Carolyn Gilbert’s photographs, Kenneth Merrick’s objects and paintings and Emma Smith’s installation combined to produce four distinctive spaces that call to one another. Catherine Fookes’ works connected object and painting. “Rena (Bay of Plenty)” evokes the stranded wreck of the container ship, perilously balanced on a reef; an environmental disaster, a monument to bad policy and the loss of innocence along New Zealand’s coast. The naïve powder blue waves lull me into an appreciation of this ungainly form, as its brown rusted and utilitarian hull protrudes physically and stylistically from the image itself. It’s a beautiful disaster. 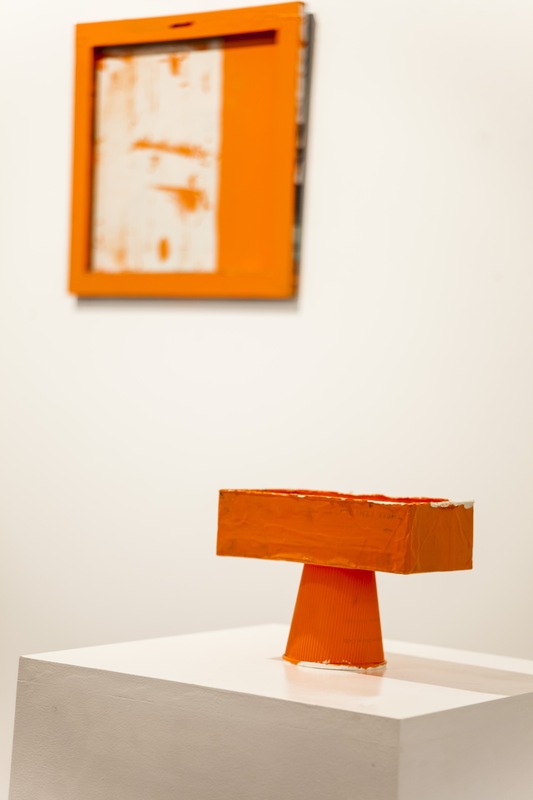 “Lucky Dip” is a bright orange square that energises the wall, shouting to another loud but balanced object. I recognise the object from the flyer. But on its plinth it becomes accessible; its worn edges tell me how it had obviously been torn off something else in a complex process. Speckles of paint unnerve the drenching in orange paint that it had received prior to its separation. Returning to the painting, the reversed frame looks contemporary but the messy canvas is half untreated and marked. Is this made of rubbish too? I stand back and appreciate the crisp white wall of the gallery supporting the raw canvas, dipped and rotated and attached in reverse. A slender strip of painterly canvas, – pink and green – catches my eye. It is stapled to the inside lip of the frame like a piercing. The drenched object and dipped work call to each other in solidarity. It seems altogether modernist but with an exuberant disregard for discipline. “Peanut butter and jelly” is hung by metal wires, the landscape canvas in pinks and blues harbours a metal plated wooden frame in its midst. Excessive, the caramel squiggles on the frame are shiny and brown. Within the frame are sliced up curls of canvas, the threads and underlying colours of which teasingly hang from the work. The painting can barely contain itself, like a small child dressed in her mothers’ heels with lipstick smeared on her face. It squeals in delight: “Look at me! I’m beautiful!” Nestled below on its plinth is another exquisite disaster. Some kind of congealed paint cake slumped over an upside down jar. Smeared with peanut butter brown, and limp in its rectangular form, the object is in perfect collusion with the torn canvas lovingly protected by a generically kitsch frame, itself aided and abetted by the addition of a squiggle. “Peanut butter and Jelly” is delightfully naughty. 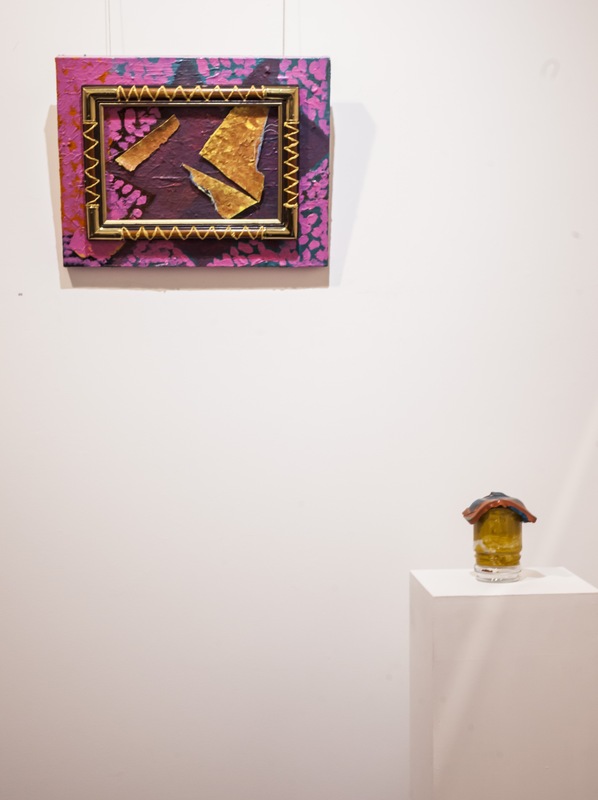 The co-dependence and juxtaposed personality of each piece within the show reveal a unity in diversity. The playfulness of her aesthetic counter-balances an apparent disregard for convention, which results in genuinely disruptive works. Beneath the naughtiness, the detritus, the in-your-face colours and the excess, there was an evident joy in the devotion to creativity. If you missed ”Painters in the Third Dimension”, Catherine is currently showing work at Helmut, 21 Mt Eden Road, Newton. Open Tuesday – Saturday from noon. Check it out!